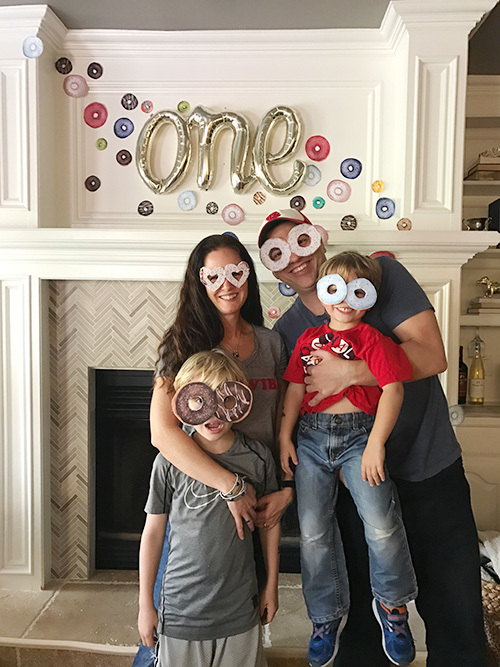 The twins recently celebrated their first birthday, and to celebrate we threw them a fabulous donut-themed party with our nearest and dearest. I don't throw that many parties but when I do, I get really into it. I just can't help myself! 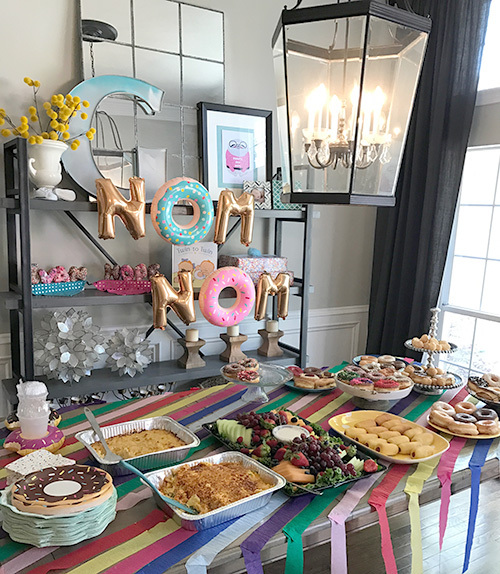 I had so much fun planning this party for our babies, and I've been so excited to share all of the details with you. I have known all along that I wanted to throw a donut-themed party. Donuts are really trendy right now, but we have our own reasons why this is a special party idea for us. 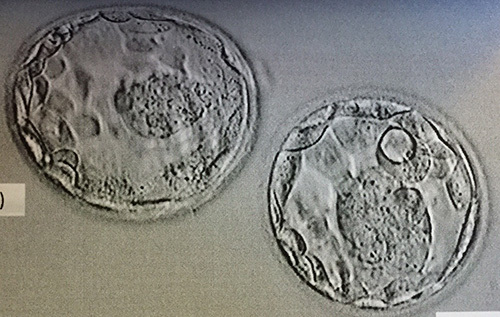 Our twins are IVF babies, and the first time we laid eyes on them was in this photo of our embryos from our fertility specialist. We joked that they looked like donuts. I had this dream that one was a boy and a girl (I was right!) and I used to doodle these blue and pink donuts long before we found out the gender of these babies. 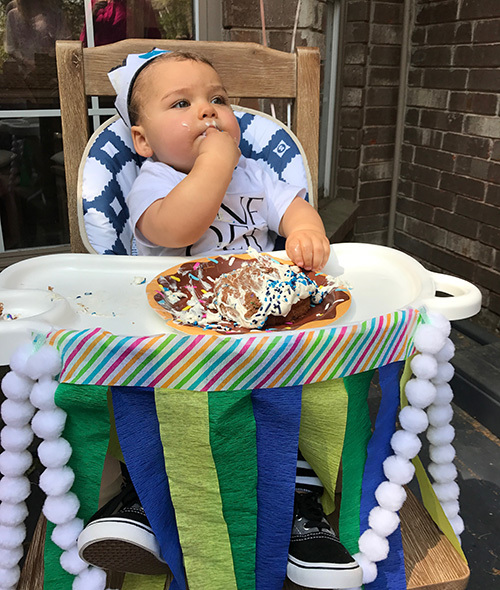 Not only does the donut theme have special meaning to us, but it's also gender neutral and it works for the time of day we wanted to have the party (11 a.m. - 1 p.m.), which was right in between the twins' naps. Can't have grumpy birthday babies, right? 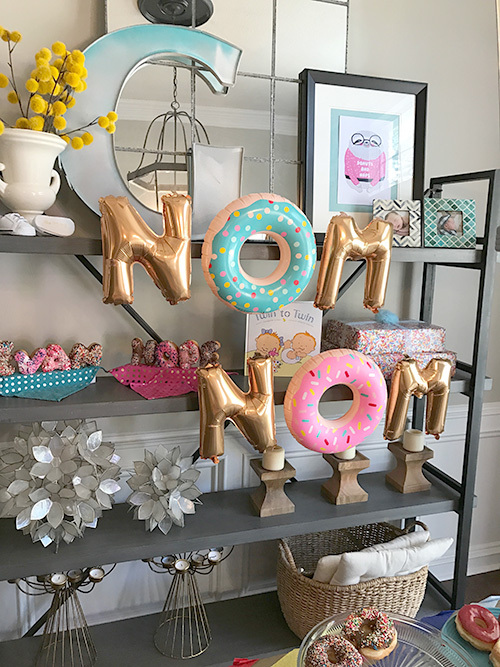 I searched long and hard for donut invitations that worked for boy/girl twins, but most of them just seemed too girly for my taste. I finally decided to DIY the invitations so that I could get exactly what I wanted. Have you ever tried Creative Market? I hadn't used this website before the party, but it's really an amazing resource. I spent $3 to purchase these watercolor donuts, and I ended up getting so much use out of them. I would argue this is the most important $3 I spent on the entire party! For that $3 I got digital downloads of eps files with the donuts, which meant I could enlarge or shrink or repurpose the donuts however I wanted. I used them for the paper suite and decor (keep reading for that part). 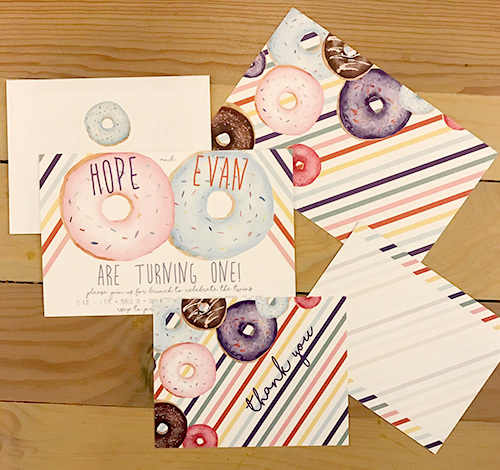 Using the watercolor donuts as my jumping off point, I used Adobe Illustrator to create really fun, bright invitations that helped me set the color scheme for the entire party. Then I made matching thank you cards and even some donut stickers for the envelopes. (Did I mention I get carried away when I plan parties? ) I printed them with Vistaprint, and it was really cost effective for a custom invitation suite. I wanted the party decor to be really fun and colorful, so I used the bright multicolored stripes from the invitations as my inspiration. 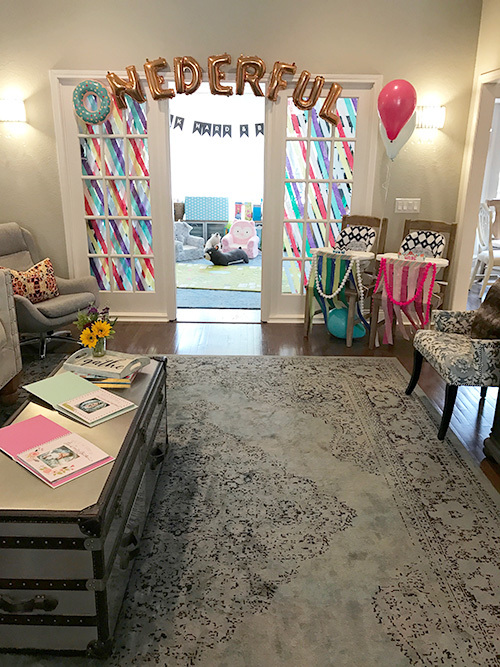 Using crepe streamers from the Dollar Store, I added stripes as a festive "table cloth" for our food table and even jazzed up the glass doors that lead into the playroom. My original thought was that the twins would do their cake smash in front of the glass doors and the streamers would make a great backdrop for the photos, but we ended up doing the cakes outside. Still, the streamers looked so cute behind the panes of the french doors and really made our formal living room more youthful and festive for the party. Note to other parents of babies/toddlers who may want to imitate this idea: Don't do it too far in advance. 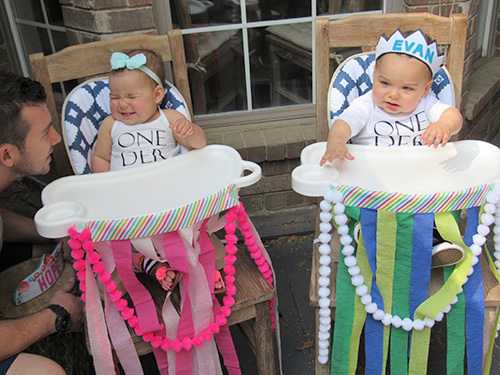 Your babies will want nothing more than to tear all of your streamers down. I tried to do this weeks in advance, and I spent the next weeks trying to stop the twins from undoing all my hard work! Another key party element were our inflatable donuts. I bought several donut-themed items from Oriental Trading, including the inflatable donuts we used above the doors and in the "nom nom" decor by the food display. I also bought a huge donut pool float and even some inflatable donut cup holders. The idea of me getting carried away while buying donut paraphernalia is a theme you'll see throughout this post. Guilty as charged. 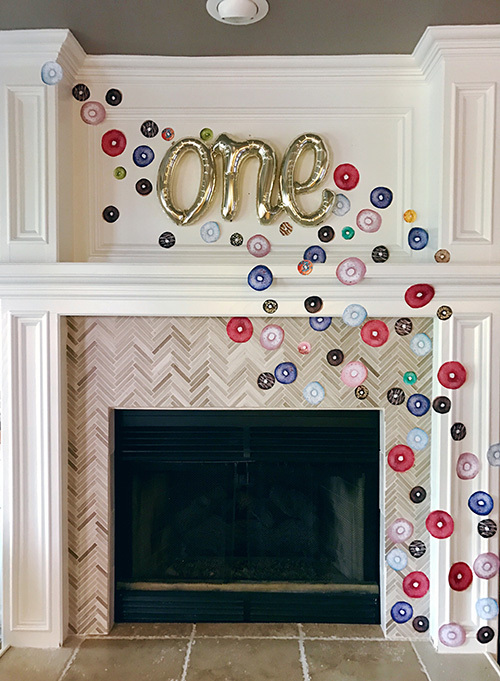 The watercolor donuts made another appearance by our fireplace, where I set up a casual photo booth area with my new Fujifilm Instax (a recent Craigslist purchase - so fun!) and some DIY donut glasses I made by cutting out the watercolor donuts and gluing them on stiff felt. I also made some donut glasses myself by just drawing on the stiffened white felt with markers. The donuts were glued on Dollar Store sunglasses, both kid and adult, after I popped out the tinted lenses. I bought that awesome script, cursive ONE balloon from the adorable Etsy shop Party Haus. We used the photos of our guests to make some guest book pages in the scrap book I've been keeping to document their first year of life. It turned out just like I imagined! Printing out the photos onsite is really a fun element for a party. 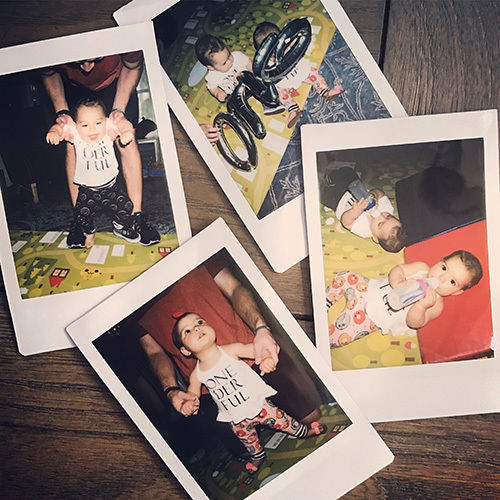 We had an Instax at my best friend's 30th birthday party back in October and let me tell you, we had fun with that thing! 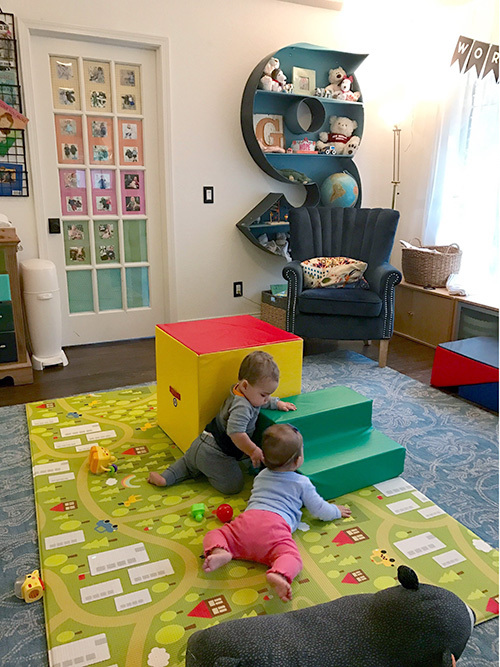 In the playroom, I used scrapbook paper and the panes of another french door to document the twins' monthly photos. I don't have a great photo of this part because the party itself was such a blur, but here's a photo from a week before the party. This is another decor element I was able to do ahead of time, and I plan to leave it up for a while because I enjoy seeing their baby pics so much! 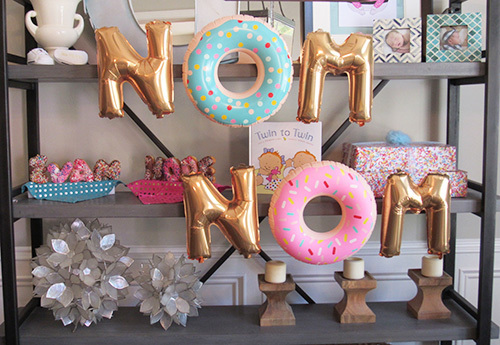 You may have noticed with my "nom nom" and "onederful" displays that I'm definitely a fan of metallic letter balloons. What can I say -- I love both balloons and I love words (especially birthday puns) so letter balloons were a must. I bought them all from my normal source, Bargain Balloons. I didn't discover this until it was too late, but they even have a great selection of the scripted word balloons. I love the "yay" balloon -- imagine how many occasions you could use that for! The rest of the balloons are from my existing collection and the Dollar Store. 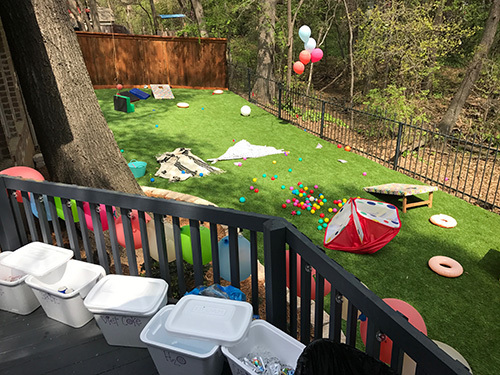 I strung them with fishing line along the deck in the backyard and then had some blown up with helium to decorate other spaces throughout the party. When in doubt, add balloons! I made it my mission not to miss an opportunity to incorporate more donuts into the party decorations. Of course I had to use these donut Christmas ornaments, a special gift from my mom when we were pregnant with our "donuts," on the front door wreath. 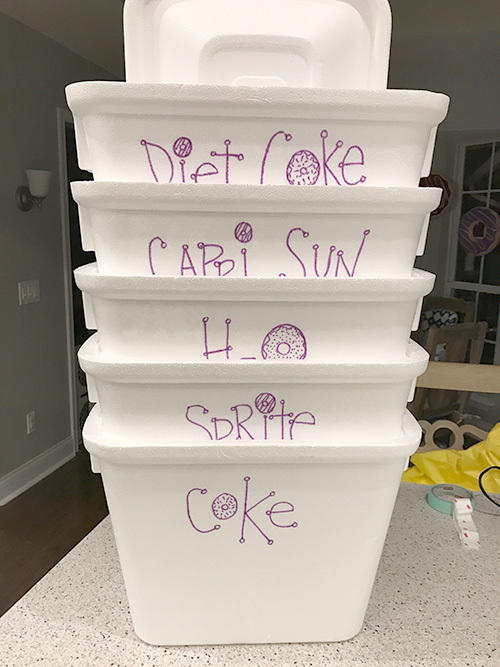 And since I was going to label these cheap foam coolers from Walmart anyway, why not make all of the "O's" into donuts? It's obvious how much fun I had with this party theme. 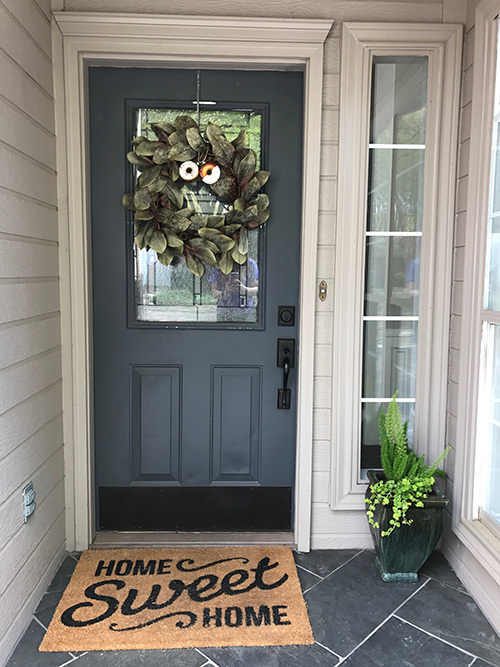 One thing I couldn't resist was this sloth donut print I found in the Whistleburg shop on Etsy. I'm a sucker for sloths, and I loved the idea that I could hang it in the nursery after the party. 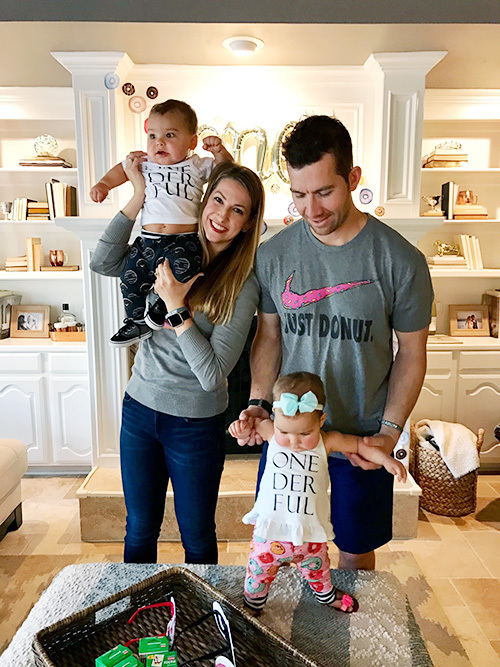 It was perfect for the shelves in the dining room, along some newborn photos of the babies, a gift from my best friend wrapped in the cutest sprinkle wrapping paper, plus some very special donuts for the birthday twins! I decorated the high chairs with streamers and pom pom garland. So easy, and so cute! 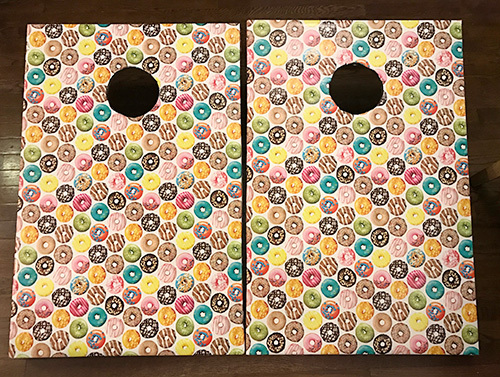 I found some donut wrapping paper that ended up being really useful. I used it to make our corn hole boards more party-specific, and I even wrapped the top of our old picnic table to make it a good surface for eating and coloring. That table is so worn out, so this was a really nice way for me to be able to use the table without being embarrassed about how it looks. I knew I wanted to cater the party. I'm not that great at cooking, and I didn't want to have to stress about the food on top of everything else I had to do myself. I love DIY, but I also know when something it's my strength! I catered some yummy breakfast foods from our local grocery store including migas egg casserole, hashbrown casserole and a beautiful fruit tray. 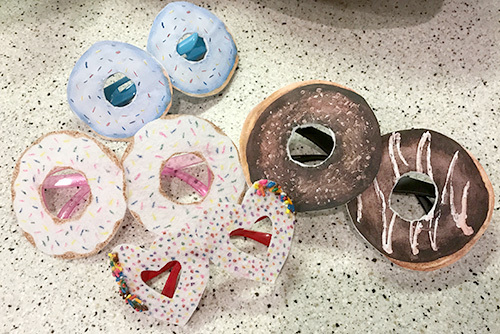 We have a great little donut shop that supplied a gorgeous and delicious selection of donuts for all of our guests, along with some special name donuts for the birthday twins. The donut shop also supplied the kolaches which were gone instantly. Probably should have bought more of those! Much like a wedding, I was so busy chatting up our guests that I didn't get to eat. Every single donut was gone except the name donuts on the shelf, so at least I got to eat those after the party ended. For drinks we had mimosas, beer, sodas, Capri Sun and bottled water. We set most of them up outside in coolers except for the alcoholic stuff, which was in the kitchen where it was too high for the adventurous little kiddos to reach. You can see the cooler setup in this "aftermath" photo from the deck. I did make the smash cakes myself. That was a bit of a disaster because it was really late the night before the party, and I kept messing up the ingredients because my brain was fried at that point. But then I remembered the kids weren't picky and had never even had cake before, so I fed them some crumbly little cakes that they thought were the best thing ever. 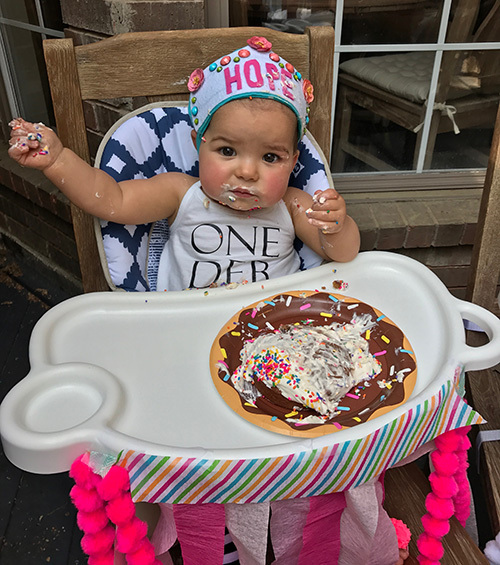 The icing is Cool Whip, which has less sugar than normal icing but is very fun for a baby to play with, and isn't that the point? I really stressed about how to entertain our party guests. (This is the reason I don't throw that many parties - I always worry that people won't have fun and then I talk myself out of it!) Anyway, it was challenging because we were inviting people of all ages and life stages, including kids from 6 months old to 10 years old. 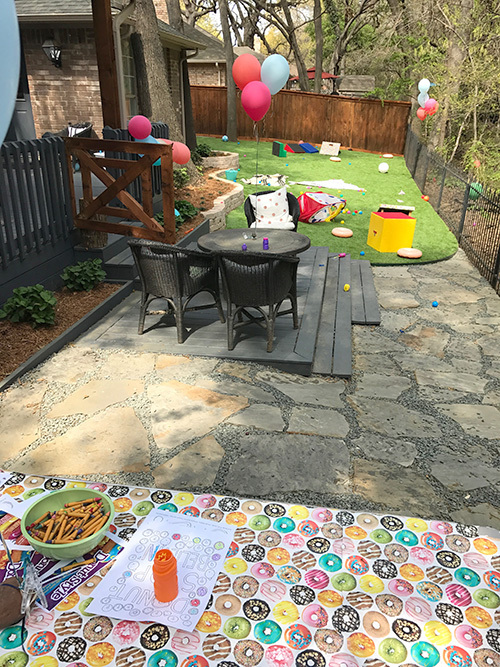 I decided to just set up stations and play areas throughout the house and the backyard, and I hoped that people would find a spot to play that suited their family. In the backyard we had bouncy balls, inflatable donuts, corn hole, a teepee and a foamnasium. We also had a picnic table with crayons and donut-themed coloring pages. Inside we had the photo booth and the nursery, which was full of infant toys. In the driveway we had sidewalk chalk and bubbles, but we ended up moving the bubbles to the backyard. 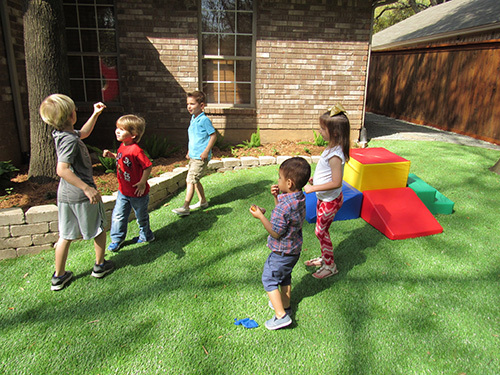 Almost everyone made their way to the backyard and hung out while their kids played together, so it was really easy. 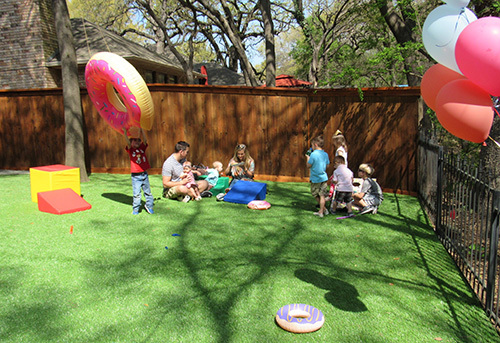 Thank goodness we finished our massive backyard renovation and artificial grass installation just in time! It was so satisfying to see our guests having a blast back there. 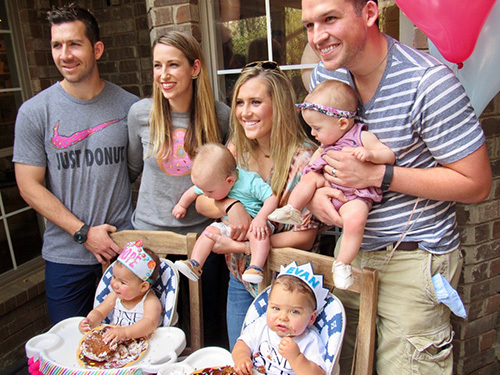 File our family's party wardrobe in the "Jordan got carried away with the donut theme" category. I'm not even mad about it -- we are now that family who coordinates party outfits. I wanted the twins to have coordinating outfits that fit the donut theme, and that was harder than I anticipated. Everything donut-y was pink and sprinkled. Evan is a little hoss, and he needed some manly donut pants! I found this Etsy shop, Little Teepee Designs, who had tiny pants in the most masculine donut fabric I'd ever seen. I reached out to the shop owner and explained that I really wanted to buy custom pants for my boy/girl twins. She didn't have any girly donut fabric onhand, but she was fabulous and quickly tracked some down for me. We worked together to design the pants with the striped cuffs to tie them together as a coordinating set, and they are just adorable. The fabric is incredibly comfortable, and I wish I had some of her leggings in my size. I can't recommend her enough. Thanks Alexis!! I designed the twins' ONEDERFUL shirts myself, and then a good friend of mine used her Silhouette machine to print them on plain white shirts I bought at Children's Place. How cute is that little peplum halter top? Can't beat the price right now - $3.58! 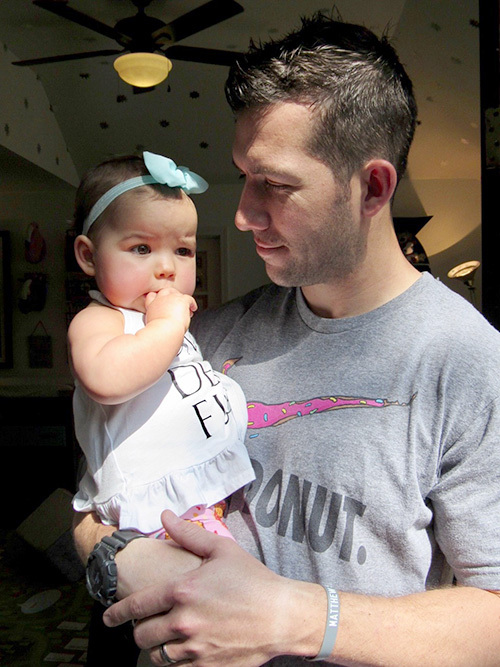 I found my donut sweater - from a past season at Target - on Poshmark, and I am extremely proud of myself for finding a donut t-shirt that my husband would actually wear. We got him the tri-blend t-shirt, and it's super soft and fits perfectly. I'm planning to steal it for myself like I do with all of his best t-shirts! I almost forgot the birthday crowns! My best friend and I made those with some of my old workout headbands and some felt. Hope's has some extra embellishment that I bought in the scrapbooking section at Michael's. She is in full headband/sock/shoe rebellion right now, so I was amazed that she tolerated the crown for the cake smash. Truly a birthday miracle! I don't have a picture of this, but each kid took home party favors in these cute sprinkled bags from Oriental Trading. The favors included a tub of PlayDoh (highly recommend this mega-pack of PlayDoh from Amazon - great variety of colors at a low price) and a baggie of donut cereal - Sprinkle Donut Crunch, to be exact. Fair warning: The cereal is addictive! 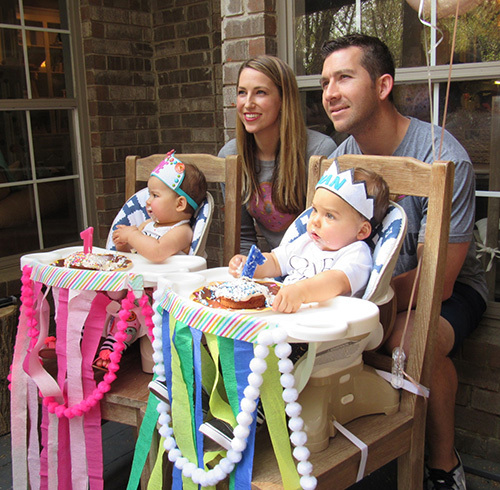 Well, that's a wrap on the twins' first birthday party. 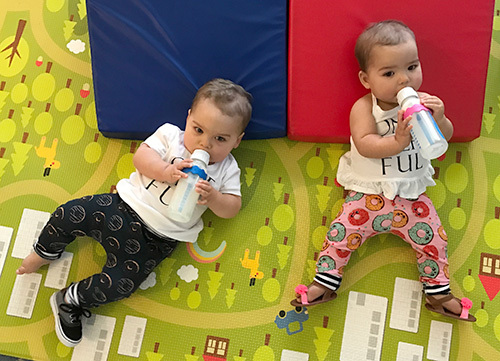 It was a lot of work to pull the party together, but the nice thing about twins is that you only have to throw one party! We love them so much, and celebrating them with our friends and family was such a treat. If I left out any party details or sources, don't hesitate to contact me with your questions.